From whitening to root canals, Ballentine Dental is equipped to handle all your restorative dental needs. To help you understand your options, we've included descriptions of some of our leading services on this page. 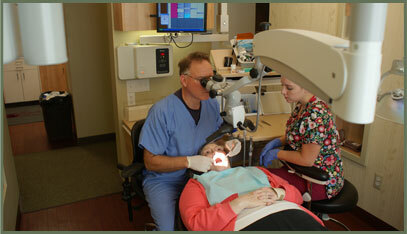 Pictured below, Dr. Ballentine utilizes the surgical microscope. Commonplace in endodontic practices, but usage in general dentistry is less than 1%. Cutting edge technology. Experience and youth, father and daughter, a seamless transition taking care of your family and your children's family. A state of the art dental office emphasizing a relaxed atmosphere utilizing the latest techniques and equipment.